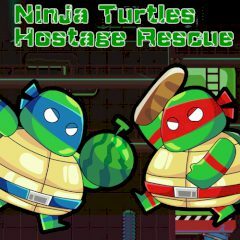 Take control of two ninja turtles and try to save all hostages of the level. One turtle uses bread to fight, while another throws watermelons to blow up obstacles and the enemies ahead. Use your weapons smartly! Somebody has to save those hostages, but they are being guarded by evil thugs. Ninja turtles will save them, but you should direct their moves and make sure everything goes smooth. Collect breads and watermelons on your way and use them to kick the enemies and blow obstacles. Save every single hostage and proceed to the next level.